When guests are not spending time in the yoga pavilion, or lounging by the pool, the Anaha Spa offers a wide range of treatments for guests to enjoy, ranging from traditional Ayurvedic treatments to modern treatments. The resident yoga teachers at Shreyas teach traditional Hatha Yoga and Ashtanga Vinyasa Yoga. 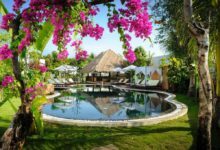 The yoga programme includes twice daily group yoga classes and several private classes so that guests are fully immersed in the retreat experience. Classes mostly take place either in the open-air yoga and meditation hall so that you feel surrounded by greenery as you practice. Delicious vegetarian meals are served three times a day. All begin in Shreyas’s own organic garden. 14 guest bedrooms are spread over the Poolside Cottages which surround the central infinity pool, Garden Tented Cottages and the 3-bedroom Cottage. Below is our guide price for visiting Shreyas during low season. If you let us know your dates we adjust the price accordingly and also include flights too! Flights are into Bangalore and direct flights are now available from Heathrow with British Airways.